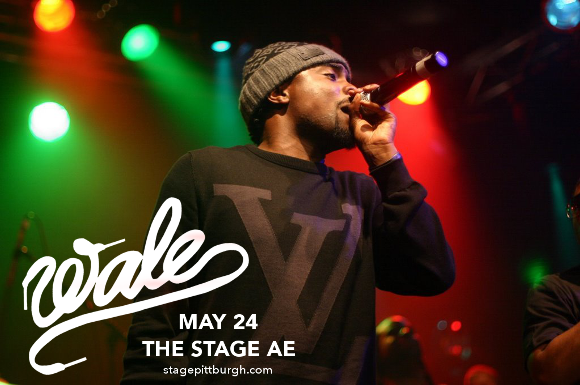 We’ve got a very exciting event coming up for you at the Stage AE on Wednesday 24th May – it’s Wale on The Shine tour in support of his upcoming, brand-new album!! It’s going to be an epic show – will you be there?? Hit the “Buy Tickets,” button above to be sure of your place – but hurry, they’re going to sell out VERY fast! Rising to fame in 2006 with “Dig Dug (Shake It)” which became hugely popular in his hometown of Washington D.C. Discovered and signed by legendary producer Mark Ronson to Allido Records in 2007, he released his first full-length album two years later, “Attention Deficit,” to much praise from critics, and a warm reception to the popular singles "Pretty Girls”, "Chillin", and "World Tour". With his unique, go-go inspired musical style, described by Allmusic as; “a more raw, percussion-driven offshoot of disco,” and his witty way with words, he’s developed an enormous worldwide following. Since then, he’s collaborated with massive names including Rhianna and Lady Gaga, and had a steady output of much-loved albums and singles. And he’s about to drop another – the brand new album, his fifth, is entitled “SHINE,” which is likely to just be out by the time his tour starts!! The hugely-hyped new release features the massively successful singles “Groundhog Day”, “Running Back”, featuring Lil Wayne, and “Fashion Week”, featuring G-Eazy!! Be among the first to hear the brand new album LIVE – get your tickets to see Wale on The Shine tour today!! !